AKA "The Playe of Robyn Hoode"
This is the original version of my article on these plays. For a rewritten and much improved version, please follow this link. The which befell this other day. 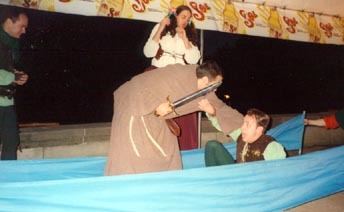 Robin Hood forces Friar Tuck to carry him across the stream on the friar's back. Part way across, Tuck throws Robin into the water. This first meeting with Tuck is very common in modern versions of the legend. That scene appears in most children's novels about Robin Hood, it appears in movies like The Adventures of Robin Hood starring Errol Flynn. And the familiar image of the friar bearing Robin on his back developed a strange new sub-text in the gay Robin Hood controversy of 1999. While this scene does occur in a later ballad, Robin Hood and the Curtal Friar, the first record we have of it is in a play. In a printed copy of the well-known early ballad The Gest of Robyn Hode, publisher William Copland attached a play, which he said was "verye proper to be played in Maye Games." The May Games were village festivals, usually held in May or June [although not often on May 1, as some historians once felt] around Whit Sunday. And for a couple hundred years, Robin Hood played a large part in such games. Sometimes costumed players from one village would proceed to another village to ask for money. Robin Hood might sell badges (such as strips of cloth) or church ales to raise money. Often the money would go for something like repairing the village church. 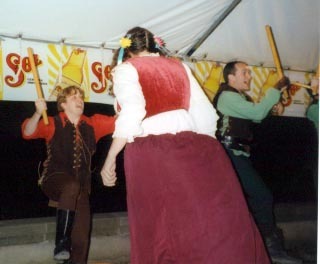 Small Robin Hood plays would be performed at this festivals, often with mock combat. Between 1427 and the mid-1600s, we have more references to these Robin Hood plays than any other kind of English folk drama. Records of the May Games (usually accounting notes on how much the costumes cost, or how much money was raised) reveal that Maid Marian and Friar Tuck were a common part of these games. But those characters do not appear in any early ballads, and aside from one major adventure a piece, only merit a couple of references in later ballads. And in Friar Tuck's case, even that major story is questionable. In the ballad version of this story, Robin Hood and the Curtal Friar, the friar goes unnamed. The first time Friar Tuck is mentioned by name as being a part of Robin Hood's outlaw band is in a fragment of play [although Stephen Knight argues that the play may be complete and just ends with an action scene] which survives from 1475. The Friar Tuck in this play is an outlaw, no different than the other Merry Men. Possibly Friar Tuck's legendary name comes from Robert Stafford, a fugitive chaplain who employed the alias Friar Tuck in the early 1400s. At any rate, nearly all the plays performed at the May Games were not written down. So, here's a summary of this one. A wagger of ballocks when other men slepes. The great ballad collector, F.J. Child, omitted those lines when he printed the play, claiming that they have "no pertinency to the traditional Robin Hood and the Friar". No wonder Child might have been a bit shocked, if -- as Stephen Knight and Thomas Ohlgren have raised as a possibility -- the friar was wearing a large fake phallus in this scene. Some, such as Barrie Dobson and J. Taylor, have suggested that the "lady free" must be Marian. Although she goes unnamed here, some old references do give Marian a bit of a bawdy reputation. This portion of the play seems to conclude with a morris dance. But the play does not end there. It continues with an opening similar to the first lines, where Robin tells his men of an adventure. Robin's annoyed that a potter refuses to pay Robin a tax for travelling through the greenwood. Little John warns Robin to be careful, because the potter is a tough fighter. Robin and Little John bet on Robin's chance of getting any money from the potter. Robin finds the potter's illegitimate son, insults him and his father and smashes his pots. The father comes by. More insults are traded. Little John joins them and it all ends in a fight. The Potter story greatly resembles the first half of ballad which currently believed to have been written down in 1468. This possibly suggests that the Friar portion of a play may be derived from an earlier version of Robin Hood and the Curtal Friar, although Stephen Knight says it's also possible that the ballad was inspired by the play. I have seen two excellent productions of the Friar half of this play. 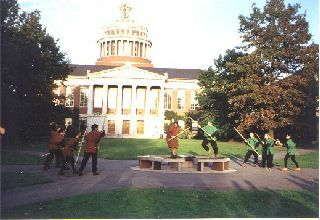 During the first Robin Hood academic conference at Rochester, NY in October, 1997, the drama students of the school staged a lively recreation of this play. They did a superb job at bringing the old text to life. Seeing it performed really brought home to me how fun this play could be. 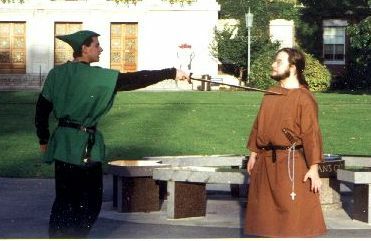 Then, at the third Robin Hood conference in June 2001 at the University of Western Ontario, another production was staged. This time the professional medieval Renaissance and drama group PLS adapted the play. The PLS version was updated with some Three Stooges-like slapstick. It concluded with a morris dance, something suggested in the original text, but that was followed by a more modern Conga line. One of the cleverest changes was dealing with the shortage of actors. There weren't enough actors for both the Merry Men and the Friar's Men. So, immediately before the big fight scene, a few Merry Men defected to the friar's side. Robin asked why, and the former Merry Man responded "Medical, dental ... and we don't have to wear kendal green!" [In the May Games, kendal green was the colour most often worn by Robin Hood and his men.] Some in the audience frowned at these changes, but I think there must have been a lot of adaptation, slapstick humour and ad-libing in the May Games. For me, this production captured the playful spirit of the Games. The fights that Robin has with Tuck and the potter resemble not only the ballads of those two characters. Many later ballads tediously are little more than mock combats. David Wiles suggested those tales are based on memories of the May Games. This play succeeds over the ballads about beggars, tinkers, Scotchmen and the rest. There are some witty exchanges between the characters, and while the combat in later ballads bores me -- it can come to life when performed live. This play not only inspired elements of most modern Robin Hood stories. It also gives us a valuable glimpse at folk festivals long past. 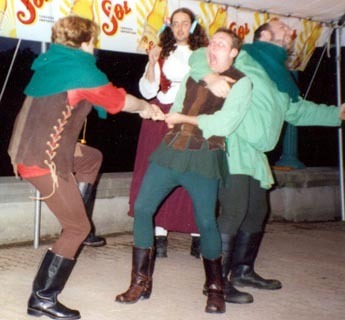 UPDATE: At the 2003 Robin Hood academic conference in York, Professor John Marshall delivered a very witty paper about the comedy of errors surrounding one production of the Friar play. When Ripon - near Fountains Abbey, Tuck's supposed home - celebrated the 1000th anniversary of their city charter in 1886, Master of the Revels D'Arcy Ferrers chose to recreate the classic scene of Robin and the Friar on what he believed was "the original spot". Plans to have 50 trained arrow-catching dogs, as in the ballad, had to be scrapped. The play of Robin Hood and the Friar and Robin Hood and the Potter is available online at The Robin Hood Project of the University of Rochester. Also online at Rochester are the original ballads of the Robin Hood and the Potter and Robin Hood and the Curtal Friar. All include scholary introductions by Stephen Knight and Thomas Ohlgren. ROBIN HOOD AND OTHER OUTLAW TALES edited by Stephen Knight and Thomas Ohlgren. Kalamazoo, Michigan: TEAMS - Medieval Institute Publications, 1997. It's a whopping 700 pages filled with ballads, plays, and historical background. Much of this book is online at The Robin Hood Project at the University of Rochester. RYMES OF ROBYN HOOD; AN INTRODUCTION TO THE ENGLISH OUTLAW by R.B. Dobson and J. Taylor. Gloucester, UK: Alan Sutton, 1989. Originally published by Heinemann in 1976, this is a classic collection of ballads and poems with a wonderful historical introduction. A new edition was released in 1997 with an updated foreword. The Early Plays of Robin Hood by David Wiles. D.S. Brewer: Cambridge, 1981. Robin Hood: The Shaping of the Legend by Jeffrey L. Singman. Greenwood Press: Westport, Connecticut, 1998.